Photo courtesy of CT Photography. 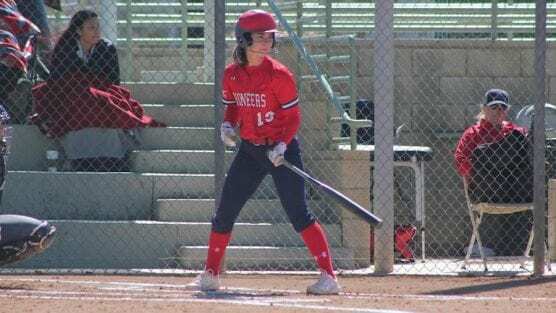 ATHERTON, Calif. – The University of Antelope Valley Pioneers were swept in their doubleheader against Menlo College (11-18), losing game one, 9-1 in five innings, and dropping game two, 6-2 on Thursday in non-conference NAIA softball action at Wunderlich Field in Atherton, Calif. The Lady Pioneers are now 7-10. Game one: The Pioneers fell behind early as Menlo added two runs in each the first and second innings. UAV would add its first run in the top of the third, but would only total three hits as the Oaks would plate four additional runs in the fourth, adding the final blow with one run in the fifth to end the game earlier than planned due to the run rule, defeating the Pioneers, 9-1 in five innings. UAV junior pitcher Ashley Adkins (Lincoln, CA) (3-4) suffered the loss and allowed nine runs, eight earned, on 11 hits, walking two and striking out none in a complete, four innings of work. Senior left fielder Erika Romero (La Miranda, CA) finished 1-for-2 and scored UAV’s lone run of the contest, and senior second baseman Kathy Perscheid (San Lorenzo, CA) and junior shortstop Amber Adkins (Lincoln, CA) each added a hit. Game two: UAV’s offense totaled nine hits in game two, but showed little production as the Pioneers would manage to just scrape across two runs in the contest as the Oaks would go on to win, 6-2. UAV freshman starting pitcher Mackenzie Potter (Lancaster, CA) (2-3) went all the way and took the loss, allowing nine hits and six runs while walking four and striking out two across six innings inside the circle. Perscheid led all players in the game with a three-hit day to go along with one RBI, senior center fielder Amanda Coley (Hayward, CA) went 2-for-3, scored two runs and walked once, and four other Pioneers finished with one hit. Next games: Coached by Steve Harrington, the Pioneers remain on the road to face NCAA Div. II Notre Dame De Namur for a doubleheader on Friday, March 22, beginning at 10:00 a.m. PST in Belmont, Calif.